So when I decided I wanted to paint our family room yellow, he just sort of assumed we’d head to the paint shop and pick up a gallon or two of yellow. Like it were that easy. I’ve been slowly decorating the family room over the past few months, picking up pillows here and lamps there. I want the vibe in the family room to be almost surprising for an 1850s farmhouse: lively, bold, and somewhat contemporary. 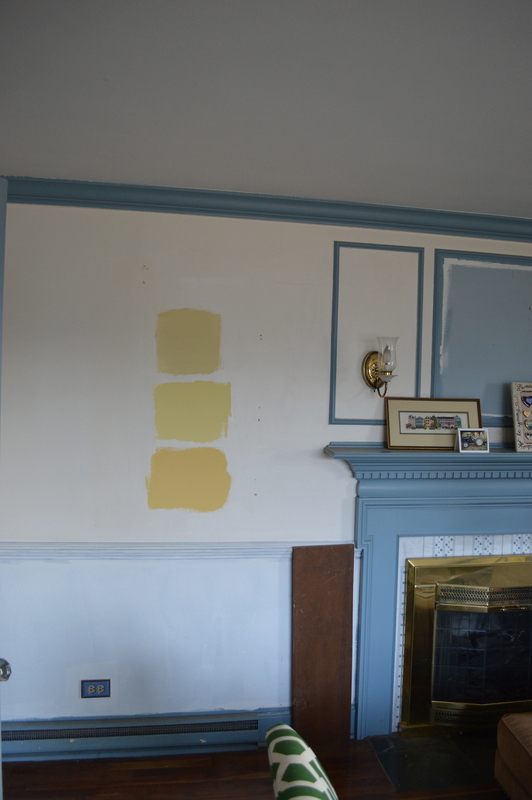 That means I don’t want a pale yellow paint that would pass for a nursery… I want to walk into the room and feel energized. Feel sunny. Having done a lot with Benjamin Moore (in our kitchen and half-bathroom) already, I wanted to use a new brand of paint– if for no other reason than to familiarize myself with the pros and cons of different paint brands. Poor David has been subjected to looking at these three shades (painted in five spots throughout the room where the sun is different) for about two months now. The paints have so much pigment that they literally change colors depending on the light in the room. These photos were taken when it was overcast and later in the day, so the colors appear fuller and perhaps a little darker than they do in the morning sunlight. Plus, the samples (painted in the same order in those five spots) all look different from each other, too. Sigh. 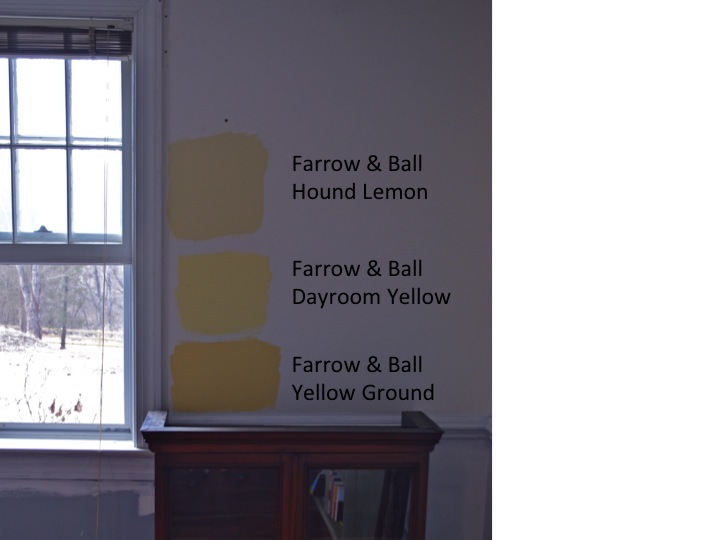 Sometimes the Hound Lemon looks too much like beige, sometimes the Dayroom Yellow looks too nursery-esque, and sometimes the Yellow Ground looks too much like a school bus. (Yes, we have two very very large crates on either side of the end tables. They are enormous but they’re here to stay, at least for the time being.) So my question to anyone reading this is which yellow do you like? I’m not 100% sold on any of these yellow paints– they really are all so different– but I know I like the idea of a vibrant yellow in this room. I think we’ve narrowed it down to two, but I’d love to hear everyone’s suggestions! Or if there’s another yellow you think would work in this room, let me know! This is so hard!!! 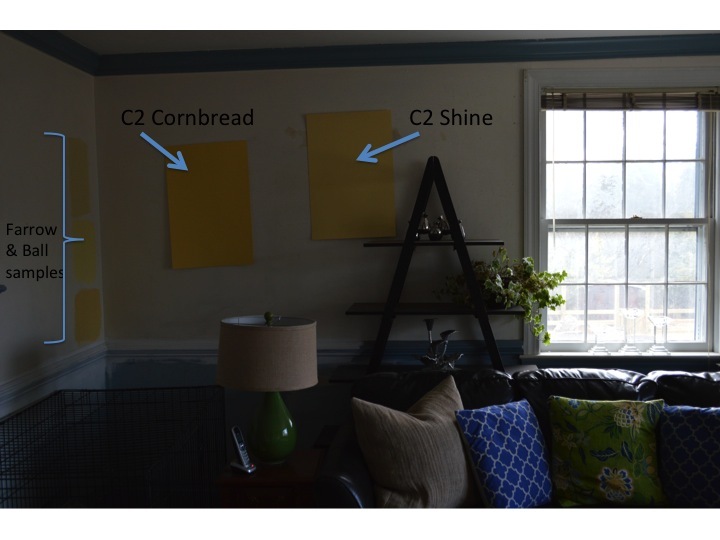 I think I like C2 corn bread, banana and f&b yellow ground. Good luck!! All are great! Our living room is a color like the yellow ground, and we love it! 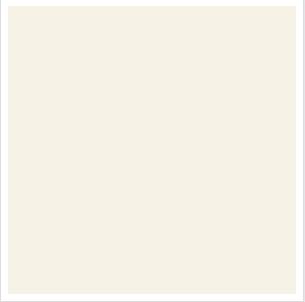 When I was growing up, my parents let me pick a color for my bedroom. I chose the brightest yellow you could find. Come to find out they toned it down by picking the lightest on the card which was still pretty bright. I also now drive a yellow car!! LOL I love yellow! With that said, I like ALL of the colors but I have to vote for one of the brightest that I saw which is Farrow and Ball Yellow Ground. 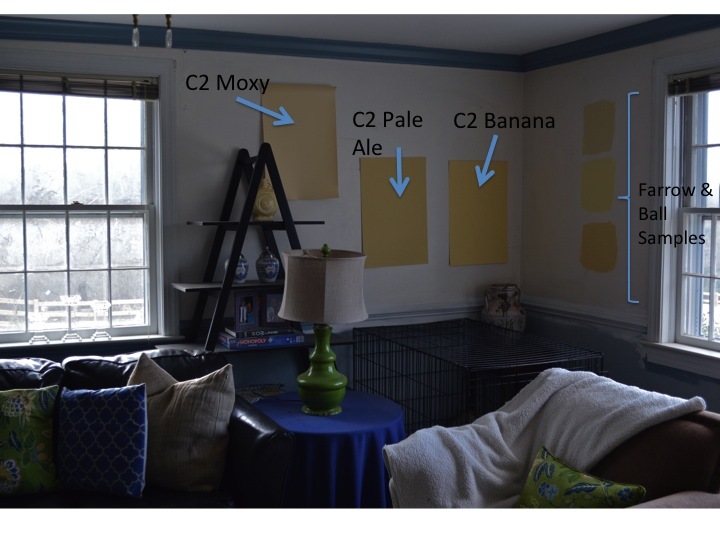 You have probably already painted the room by now but I thought I would share my two cents. 😉 Have fun renovating the house! It looks fantastic so far! 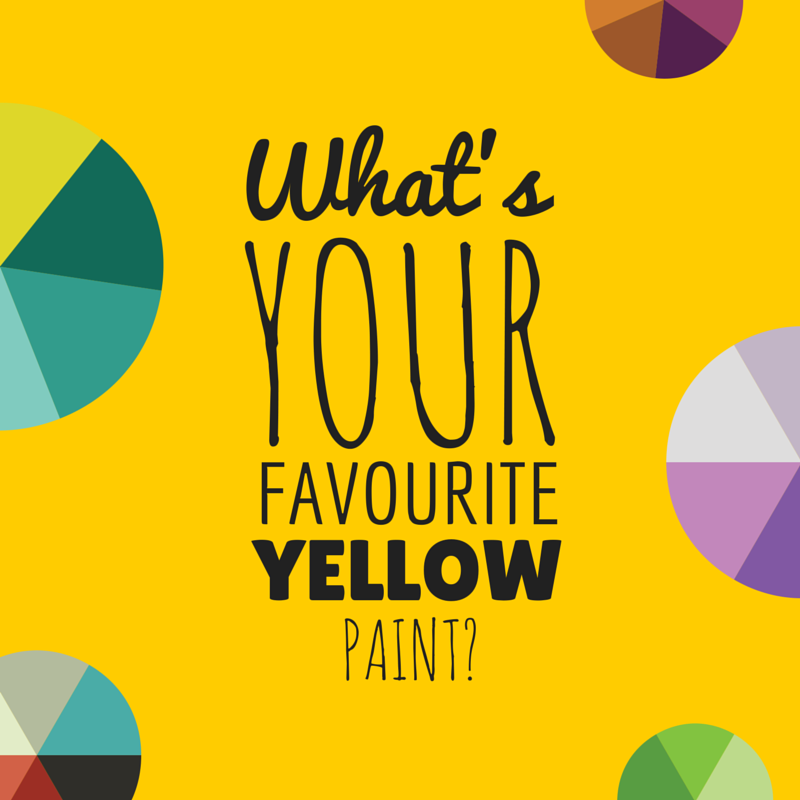 Wow– yes, you really do love yellow! I think it’s impossible to feel down if your environment is warm and sunny, which is why I was drawn to some of the yellows here. 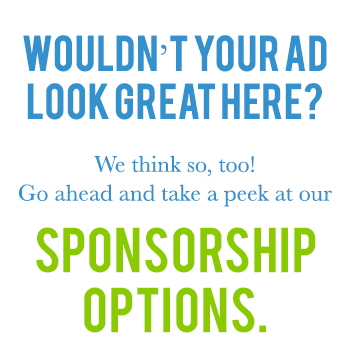 We haven’t painted yet! (We’re waiting until the pipes are done being replaced so there are no more holes in the walls.) Thanks so much! loving your colors,,, all of them… and it is so hard to decide…. Tried painting one whole wall one color and that helped me a lot… just an idea… You have much better ones than I, anyway. Keep up the good work.. love following your journey….. Yes! Green was the original choice, but the kitchen is green and the dining room will eventually be green. Since the colors of the house overall are green and yellow, I figured it would be fun to have one room be yellow– so this will be it! 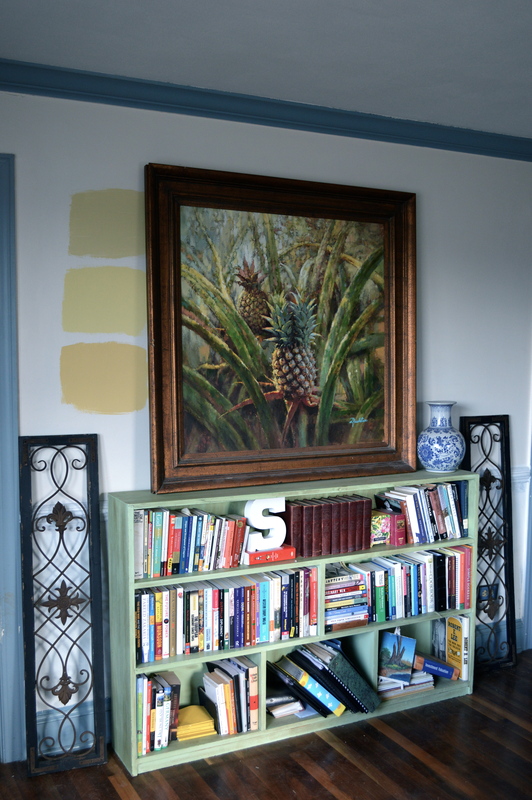 And great idea to choose a yellow that picks up one of the yellow shades from the pineapple painting. That would really make the painting pop, wouldn’t it? Thank you!